Jennifer Alexander incorporates a variety of plant and animal fibres within her textile work, which bears witness to a wide spectrum of felt, handmade paper and silk papermaking skills. Jennifer first became interested in learning how to make felt, primarily as a surface to stitch into, when she was a City & Guilds Creative Studies student. Since completing that course her feltmaking skills have developed a much wider perspective through becoming a member of the International Feltmakers Association. Jennifer’s current feltwork includes large wall hangings as well as a range of accessories – bags, scarves, hats and slippers. 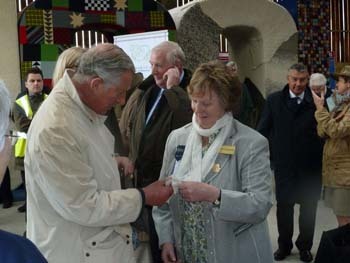 In 2006 she was one of the first students in the UK to attain the new C&G Diploma in Feltmaking. 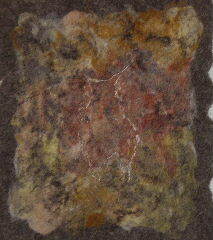 Felt is one of the oldest textiles known to man and in fact pre-dates woven material. Intrinsically felt is made from layers of woollen fibres, which are compressed by varying combinations of heat, moisture, alkalinity and friction. Jennifer has become especially interested in devising ways of using wool from the sheep flock at home. The predominant breed at Millside is a highly acclaimed flock of pedigree Lleyns but of more interest for Jennifer’s feltwork are the Blue Texels. Colours within Blue Texel wool range from a steely blue colour that gives the breed its name through dark browns to silvery greys. Our current Blue Texel stock rams are passing on beautiful fleeces to their progeny. 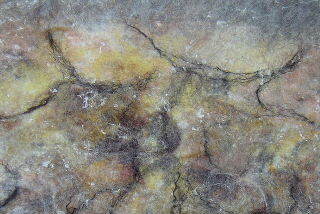 Some of the lighter greys dye beautifully creating deep and dramatic hues. The speckly character of Blue Texel wool has proved very suitable to help interpret the aged concept of cave paintings, based on line drawings of our own sheep. Controlled distortions within the felting process can transform fairly recognisable images of pedigree stock into ancient beasts of indiscernible species! Lots of new information and photos will follow shortly.